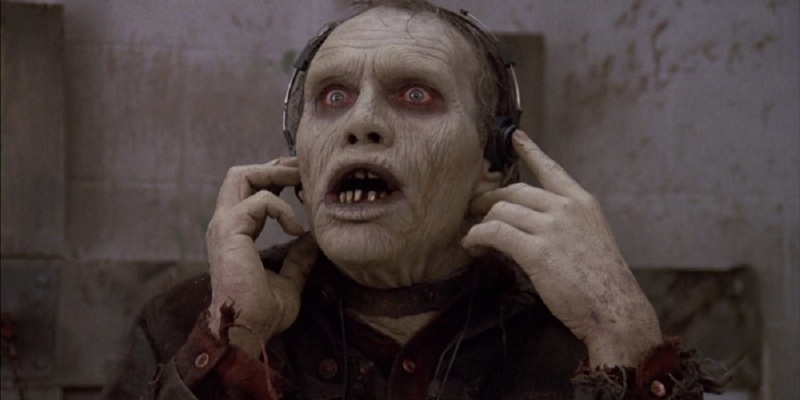 So without further ado, here’s an all-new discussion of Romero’s third zombie outing, Day of the Dead. Having already overseen explorations into the breakdown of the family unit in Night of the Living Dead and critiquing consumer culture in Dawn of the Dead, what was left for George A. Romero to take on but the military-industrial complex? Day of the Dead marked a bit of a divergence for Romero’s Living Dead series in that the underlying nihilistic impulses that drove Night’s and Dawn’s plots are here countered by what appears to be a happy ending. Instead of Ben being shot by rednecks or Francine and Peter flying away to an unresolved fate in a partially-fueled helicopter, here our heroes end the film lounging and enjoying life on an abandoned beach in the Caribbean. If this were Romero’s final say on the zombie genre it would be a fitting one, as Jamie Russell noted in his Book of the Dead, bringing zombie narrative back its Caribbean origins but contrasting its safety and isolation to America’s descent into “ghoulish cannibalism.” We’ll talk more about his eventual return to the genre later, but in 1985, Day of the Dead was Romero’s final word, despite not being anywhere near the epic film he had originally envisioned. 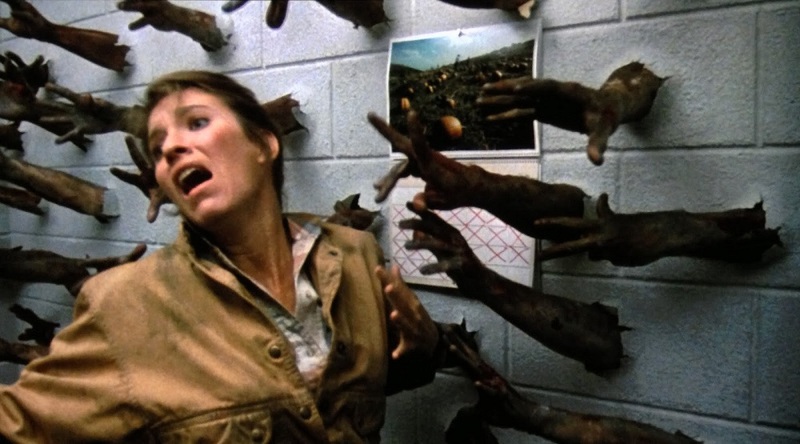 The original concept was much larger in scope, described by Romero as the “Gone with the Wind of zombie films” and by effects guru Tom Savini as “like Raiders of the Lost Ark… but with zombies.” It was still focused on the military-industrial complex but involved attempts to weaponize zombies hordes in a massive production. Of course the producers balked, only offering $7 million as long as Romero agreed to deliver an R-rated film. He refused to compromise and ended up settling for a budget of half that and reworked his 200 page initial draft into a much leaner 88 pages. Stripping down the idea this much meant streamlining the themes as well. Communication is the real problem at the core of Day as we follow a few fateful days in a military bunker located beneath the Everglades housing what may the last surviving human beings on earth. And they do not get along at all. We have three factions; the military, the scientists, and the civilians contractors. Radio operator Bill McDermott (Jarlath Conroy) and helicopter pilot John (Terry Alexander) do their jobs when needed and spend the rest of their time living away from the core base, sitting up a small oasis in the caverns. The science faction (that we care about) is made up of lead scientist Dr. Logan (Richard Liberty) not-so-affectionately called “Dr. Frankenstein” by the soldiers thanks to the disturbingly grisly experimentation he’s doing on the undead, and our main protagonist, Dr. Sarah Bowman (Lori Cardille), continuing Romero’s course-correction for strong female characters after the underwhelming Barbara in Night. The military faction, led by Captain Rhodes (Joseph Pilato) embodies pretty much every abhorrent toxic masculinity cliché one could come up with. To be honest, most of the characters are thinly drawn, sometimes functioning more like cyphers than real characters. Bill’s constantly drinking Irishman and John’s laid back Jamaican could easily be seen as simple stereotypes, but they serve a deeper purpose to the overall narrative; they are the ones caught in between. Their independence is tied entirely to their usefulness to the other feuding factions. As they sway Sarah over to their way of thinking, there’s a thematic power shift and it becomes clear that the unchecked aggression and paranoid anxieties of the soldiers is going to keep building and explode. Especially when we see that Dr. Logan has valued the advancement of his research over the safety of anyone else. If you know anything about this film at all, you know that his research is culminating in the discovery and education of the zombie he’s named Bub (Sherman Howard). Oddly enough, Bub is the most complex character in the entire film, and also the one who becomes the emotional touchstone for the audience. Bub is the zombie who thinks, after a fashion. He remembers, after a fashion. Dr. Logan’s experiments demonstrate that the undead have the potential to be domesticated, after a fashion. When contrasted with the overt violence, misogyny, and paranoia of the military, the dehumanized worldview and psychological issues of Logan, and the selfish abandonment of society of the civilians, Bub is an innocent. Kept fed on a secret diet (the flesh of the recently deceased), Bub doesn’t hungrily lust after the humans. He just wants to listen to music and recall vague memories of the life he once had. He can even speak, if only just barely. But the most important thing he can do, most important for the plot anyway, is salute and shoot a gun. Dr. Logan theorizes that Bub must have been in the military and thinks this is a huge breakthrough, but the idea of a zombie that can think and use a weapon is the last straw for Captain Rhodes. These mindless monsters can’t be allowed to grow and learn and take the place of humanity. When the base is inevitably overrun by the living dead, the military is useless. Science is useless. The only hope for anyone is to get to the helicopter and fly away to paradise, leaving the world behind for the dead to inherit. It’s an effectively self-centered ending in what is a critique of a self-centered decade. Romero’s anarchistic spirit finds itself celebrating the downfall of humanity without finding a way out the other side. While the ending seems positive – especially when compared to the previous films – there’s a more subtle nihilism at work. Because while it appears to be a happy ending, it’s really about Sarah giving up her dream of saving the world and joining our other “heroes” isolating themselves and waiting to die on a beach rather than in a bunker. There’s no real hope for a future, just the hope that they die on their own terms. Needless to say, the film didn’t do well at the American box office, bringing in just $5.8 million domestic to lukewarm reviews at best. It did better worldwide, but the unsympathetic characters and bleak, near-humorless story didn’t hit the same marks that U.S. critics and audiences had enjoyed with Night and Dawn. 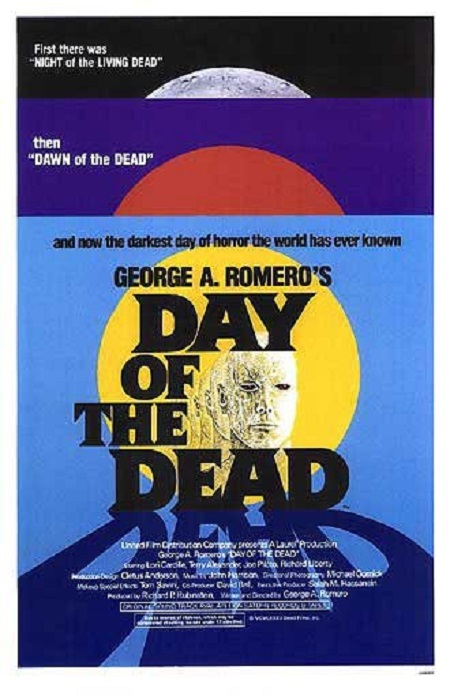 With that said, however, Day is probably the best-made film of the three, was Romero’s own favorite of the original trilogy, and Tom Savini’s effects are perhaps a pinnacle of the pre-CG world of practical gore. Day of the Dead also introduced the world to Greg Nicotero, who served as Savini’s assistant and whose good looks got him a part as one of the soldiers. Nicotero would go on to become one of the foremost effects artists in the modern industry, as well as an accomplished television director, with his masterwork, The Walking Dead.